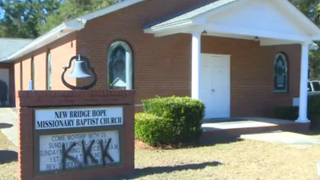 Vandalism at New Bridge Hope Missionary Baptist Church in Wakulla County, Fla., is being investigated as a hate crime. The FBI is investigating hate crimes in a rural Florida county where three predominantly black churches were recently defaced with racist graffiti scrawl, according to the International Business Times, which cites a report at the Tallahassee Democrat. The latest case was discovered Wednesday when members of Mount Olive Primitive Baptist Church in Crawfordville in Wakulla County arrived for choir practice to find "KKK" spray-painted on the side of their church, the Democrat reports. "The whole community is in shock right now that we still have these things occurring," Wakulla County NAACP Organizing Committee President Anginita Rosier told the paper. The first case was discovered last Sunday when members discovered that signs for the New Bridge Hope Missionary Baptist Church in Crawfordville were spray-painted with "KKK," the report says. A second church, Pilgrim Rest P.B. Church, was also vandalized. One suspect has been cleared in Sunday's vandalism, the report says. Authorities said they were pursuing three more suspects on Thursday. A $5,000 reward has been offered for information leading to an arrest, the report says. The problem may lie in the Wakulla County Sheriff's Office itself, the International Business Times notes. On Dec. 2, five deputies were suspended over comments they made on Facebook about the grand jury's decision to clear Ferguson, Mo., police Officer Darren Wilson in the fatal shooting of Michael Brown, a teen who was black and unarmed, the report says. "Damn cockroaches! Squash 'em all!!!! I say we rally for Wilson, who's with me?" Wakulla County Deputy Richard Moon wrote, referring to the protesters, the report says. Moon was suspended for a week with pay last week because of the post, the report notes. Four other deputies were also suspended with pay: Undersheriff Trey Morrison, Sgt. Eddie Wester, Detective Rick Buckley and Detention Deputy Jeff Carroll. Rosier told the Tallahassee Democrat that there may be a connection between the deputies and the vandalism. "We feel [the KKK spray-painting incident] is directly related to the incident related to the Sheriff's Department and the officers who have been suspended so far," Rosier told the paper. The investigation continues.